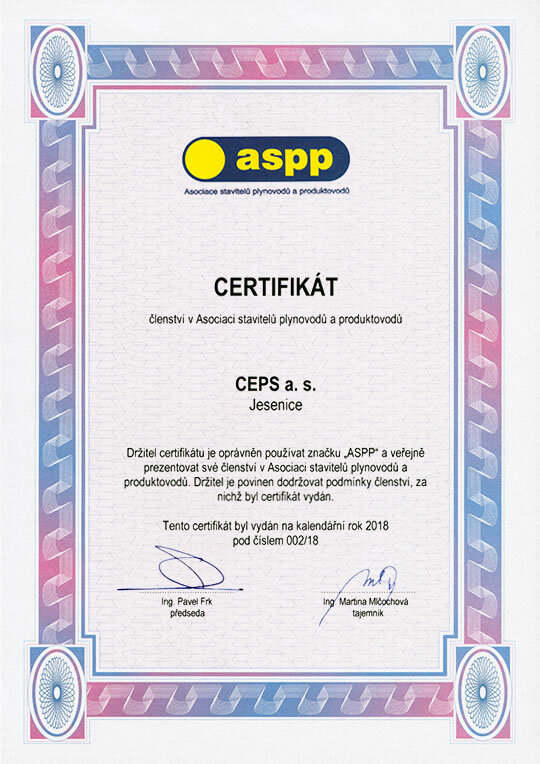 Certificate of membership in the Association of Pipeline Contractors — CEPS a.s.
CEPS is a member of both prestigious national professional organizations – the Association of Pipeline Contractors and the Czech Gas Association. Our representatives are actively involved in the work and activities of the senior management of both organizations. The holder of the certificate is authorized to use the mark “ASPP” and publicly present its membership in the Association of Pipeline Contractors. The holder is to comply with the conditions of membership, in which the certificate was issued.